Posted on 09/27/2018 by Mickey McCarter	in Interview, Live Review and tagged Black Cat, Captain Sensible, Dave Vanian, England, goth, Interview, Monty Oxymoron, new wave, post-punk, punk, The Damned. In 1976, Dave Vanian and Captain Sensible formed The Damned, the innovative post-punk band that has rocked England now for decades. The Damned released Evil Spirits, their 11th studio album, in April via Search and Destroy and Spinefarm. The record was a smash, hitting #7 on the UK Albums chart and catapulting the always vital band back into the public eye. While Dave and Captain Sensible have worked with a number of musicians over the years, Monty Oxymoron has been the keyboardist for The Damned since 1996, recording on their last three albums and touring globally with the band. And he will play with The Damned again in DC at Black Cat on Saturday, Oct. 20. 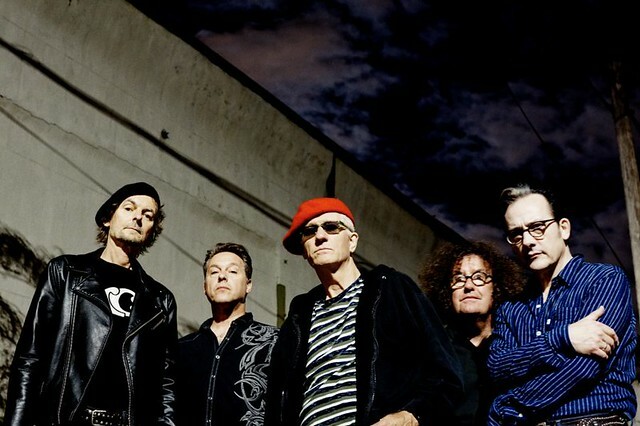 Parklife DC chatted with Monty about the new album, his history with The Damned, and what makes the band so unique and well loved for more than 40 years. Mickey McCarter: Hello, Monty! How are you? Monty Oxymoron: Not too bad — thank you! MM: The new album, Evil Spirits, is a really good album, and I was just revisiting your songwriting credits on it. You wrote one with Dave and one with Captain, and both songs really capture the personalities of those individual performers. (“Shadow Evocation” with Dave Vanian and “Procrastination” with Captain Sensible!) How do you feel about the album and how it was received? MO: I am pleased with the album! The songs have strong melodic structures that stick in people’s minds. But they are also quite quirky; the ideas expressed in them are not what you would expect from pop songs or rock songs. I’m very pleased we managed to get to #7 on the album charts in Britain! That’s really good. MM: It sounds like an album from The Damned, but it also has this great throwback vibe, and I think that’s due in part to working with Tony Visconti, who produced it. What was it like working with Tony? MO: He’s a really nice chap! There is nothing pretentious about him, and he was really nice. He kept us on an even keel in the studio, and he helped a lot particularly with the backing vocals. Some of the voices that you hear on the album are actually him! He sang along with us. We were working out arrangements, and it was like a choir in that there were so many backing vocals. It was good fun to do. It was a pleasant experience. MM: The Damned of course are a formidable live band, and you are a strong performer yourself. You get a moment in the show where you dance and have a solo. And it’s very popular and the audience eats it up. How did you get started adding that to the show? MO: I think it’s something that happened spontaneously. It might have been when we first went to Japan. In “New Rose,” I don’t have much to do, but there’s this energy! So, I started moving about spontaneously, and some people said it was pretty good — you should keep doing that! So we kept it in. MM: Now it’s a moment everyone waits for in the show! MO: Then I have to keep it up! I might drop dead on stage one day. MM: Hey, I was reading about your interest in psychiatry and your work with the UK National Health Service. Bring us up to speed. You’ve had this other career in mental health? MO: I was always interested in music, and I wanted a career in music, but I never thought I would make any money from it. It was like a hobby. So I needed some kind of career. I didn’t want a wage slave job where you didn’t like or have any connection to what you did. I had an encounter with a woman who had a psychiatric breakdown, which led me to an interest in psychiatry. So I trained as a psychiatric nurse, and initially I worked with NHS. Nowadays, I work with a private firm that specializes in the elderly with mental illness, mostly dementia. I’m proud of being a nurse. Nursing is a unique profession. It has certain philosophical precepts, and it has moral qualities that you have to live up to. You have to maintain your knowledge. Why don’t politicians have a similar code of conduct? And a governing body that would kick them out if they crossed certain boundaries? These days, I’ve become particularly interested in neurology, the study of the brain and how it works. That applies to music as well. There’s a lot of research on the relationship between music and the brain, and that unifies my two interests. MM: So when you write music, do you think about the brain and music? Or perhaps how people listen to music and their state of mind? MO: I have in the past. I’ve written songs based on my experiences in the past. More recently, they have been about myself and experiences that I’ve had myself or people around me. But yes, definitely, the business of internal states of mind. And what people are thinking. What are their emotions? What are my emotions! What am I going through? And all of that stuff. MM: So, getting back to your start. You said you didn’t know if music would become a career for you. And it seems your friendship with Captain Sensible really made it happen? Correct me if I’m wrong. When did you first meet Captain, and how did that come together? MO: I met the Captain quite a few years before I actually worked with him at a place called the Zap Club in Brighton. At the time, it was this amazing cabaret where all kinds of things were going on. He used to come around just to check out what was going on. I was trying out this and that. He liked what I did, and I got friendly with him. It wasn’t until some years later when I came across him at this night in Prince Albert pub near Brighton Station. It was a night hosted by our eccentric friend, Dr. Spacetoad. He was playing his songs and Captain was playing bass. I joined in playing percussion. And it became a band, The Dr. Spacetoad Experience. Captain wasn’t actually in The Damned at the time. I played with Captain in his own band, we called it Punk Floyd for a while, and he met up with Dave Vanian and they decided to get together again. They reformed The Damned, and they brought me along! MM: And what a great band you guys are. Do you have any reflections on the longevity of the act? Here we are with more than 40 years since the formation of The Damned, and you’ve been a member for more than 20 years now. Why do The Damned endure? Why do people love The Damned? MO: Captain alway says he didn’t think it would last a year when they first started! But it definitely has withstood the test of time, and I think there are various reasons for that. One of the reasons is that they came from the streets really. Captain and Dave didn’t train to be musicians. They are people who naturally have a gift and talent. They’ve listened to people who have played before, and they realized, yeah, we can do this — we can play music. *And* they truly can. Dave is a fantastic and unique voice. That’s definitely a contributing factor. And the songwriting is different. Some of it is quite quirky; you wouldn’t get those songs from people who went through music college and things like that. There are chord structures that just kind of jump, and you go, whoa! what’s that? I’m thinking of “Under the Floor Again,” where there’s a really strange jump from one key to another. Somebody who went to school to learn to write songs probably wouldn’t do that. But it works! And it’s unique and interesting. We don’t have an elitist air, and I think that helps people relate to us as a band. We’ve come up from the streets, and we can still do it. And the band has changed over time. Some people would like the band to always be like the first album, but The Damned have moved through so many different styles to show what they can do and to explore and try different ideas. MM: Are there other songs you particularly enjoy playing? Songs you like or consider musically innovative? MO: There are so many! We recently performed the shortened version of “Curtain Call,” and I really enjoyed coming back to that again. I also enjoy songs that have a certain amount of room for improvisational jamming in them. It’s going to be unique every time and never the same. MM: What happens next with The Damned? Do we get another 40 years? MO: I have no idea! I didn’t think I would be doing it for this long, but thank god I have. I still enjoy doing it, and I don’t get jaded with it at all. I still enjoy the songs, and I still enjoy playing in front of people. So, hopefully, we will keep going for a long time. MM: Great! We look forward to seeing you here in DC at Black Cat on Oct. 20, Monty. MO: We love the Black Cat. It’s a really good venue. Catch The Damned in DC at Black Cat on Saturday, Oct. 20. Buy your tickets online.